As last year, I have decided to write a blog post about my point of view on the IoT developer survey from the Eclipse Foundation (IoT Working Group) with IEEE, Agile IoT and the IoT Council. From my point of view, the final report gives always interesting insights on where the IoT business is going and about that, Ian Skerrett (Vice President of Marketing at Eclipse Foundation) has already analyzed the results, available here, writing a great blog post. It’s clear that industries are adopting IoT and there is a big increment for industrial automation, smart cities, energy management, building automation, transportation, healthcare and so on. IoT is becoming “real” even if, as we will see in the next paragraphs, it seems that we are still in a prototyping stage. A lot of companies are investing on that but few of them have real solutions running in the field. Finally, from my point of view, it could be great to add more information about countries because I think that there is a big difference on how and where every country is investing for IoT. Security is always the big concern but, as Ian said, interoperability and connectivity are on a downward trend; I agree with him saying that all the available middleware solutions and the IoT connectivity platforms are solving these problems. The great news is that all of them support different open and standard protocols (MQTT, AMQP but even HTTP) that is the way to go for having interoperability; at same time we are able to connect a lot of different devices, supporting different protocols, so the connectivity problem is addressed as well. Coming back to security, the survey shows that much more software developers are involved on building IoT solutions even because all the stuff they mostly use are SSL/TLS and data encryption so at software level. From my point of view, some security concerns should be addressed at hardware level (using crypto-chip, TPM and so on) but this is an area where software developers have a lack of knowledge. It’s not a surprise because we know that IoT needs a lot of different knowledge from different people but the survey shows that in some cases not the “right” people are involved on developing IoT solution. Too much web and mobile developers are working on that, too few embedded developer with a real hardware knowledge. Languages : finally a distinction ! Last year, in my 2 cents, I asked for having a distinction on which side of an IoT solution we consider the most used programming languages. I’m happy to know that Eclipse Foundation got this suggestion so this year survey asked about languages used on constrained devices, gateway and cloud. On constrained devices I expect that developers uses “no OS” (programming on bare metal) or a really tiny RTOS but not something closed to Linux. On gateways I totally agree with Linux but Windows is growing from last year. From my point of view, the presence of TCP/IP in the connectivity protocols results is misleading. TCP/IP is a protocol used on top of Ethernet and Wi-Fi that are in the same results and we can’t compare them. Regarding communication protocols, the current know-how is still leading; this is the reason why HTTP 1.1 is still on the top and HTTP 2.0 is growing. MQTT is there followed by CoAP, which is surprising me considering the necessity to have an HTTP proxy for exporting local traffic outside of a local devices network. AMQP is finding its own way and I think that in the medium/long term it will become a big player on that. Having Amazon AWS on the top doesn’t surprise me but we could have more details on how it is used by the IoT developers. The IoT business is growing and its adoption as well but looking at these survey results, most of the companies are still in a prototyping stage and few of them have a real IoT solution in the field. Few days ago, the Eclipse Foundation published the report of the last IoT developer survey sponsored by the foundation itself with IEEE IoT and Agile IoT. This survey has as main objective to understand what are the preferred technologies used by developers in terms of languages, standards and operating systems; furthermore, it shows what are the main concerns about IoT and how companies are shipping IoT solutions today. Great content about this report was published by Ian Skerrett (Vice President of Marketing at Eclipse Foundation) on his blog and on slideshare with a summary of all main information about it. Regarding how companies are delivering IoT solutions, it’s clear that the IoT market is growing. A lot of companies already have IoT products in the fields and the others are planning to develop them in the coming months. It’s not a surprise, other than a buzzword, the IoT is a real business opportunity for all companies strictly related to the embedded devices (silicon vendors, OEMs, ..) or software companies (for the cloud and application side) which are rapidly change how their business is made. The result related to the main concerns about IoT is very clear : people and companies are worried about the security. All data flowing from our personal life or owned by companies to the cloud need to be protected in order to avoid someone can steal them. The concern about security is strictly related to software protocols (i.e. SSL/TLS, …) and hardware stuff (i.e. cryptochip, …) and today it seems that a very good solution isn’t available. The same is for interoperability : having a lot of IoT standard protocols means having NO standard protocols. A lot of consortiums are trying to define some standard specifications and frameworks in order to define a standard but … they are too much; all big companies are divided in different consortiums and some of them are part of more then one : this is a big deal, as for protocols … it means NO standard. Having HTTP/1.1 as first used protocol is real because today it’s the only well known protocol in the developers world; in order to develop and deliver an IoT solution with a quick time to market, companies leverage on internal know-how and sometimes they don’t invest to figure out how other protocols work and if they have other advantages. It explains to me this position, thanks to HTTP/1.1 simplicity and its ASCII/text based nature : a lot of developers don’t like binary format so much. Last point is that the REST architecture is a very good solution in a lot of scenarios and HTTP/1.1 is the most used protocol (the only one ?) for that. MQTT and CoAP are used a lot thanks to the available open source projects and their simplicity; MQTT is very lightweight and works great on tiny embedded devices, CoAP tries to overcome some HTTP/1.1 disadvantages (i.e. server push, observer, …) with new features and its binary nature. A lot of developers are scared about AMQP because I have to admit it’s not so simple like the previous ones but it’s powerful and everyone should give it a try. If you want to start with it, you can find a lot of links and resources here. I’m surprised by the fourth position of HTTP/2.0 ! I mean … how many developers know, love and use HTTP/2 today ? I was surprised by this high position … I expected it behind “in-house, proprietary”, AMQP and XMPP. I suppose that companies are prototyping solutions using this protocol because they think that thanks to the HTTP/1.1 knowledge it’s quite simple to move to the next version : I think it’s totally wrong, because HTTP/2.0 is completely different from HTTP/1.1. I love it … I’ll invest in it. Regarding operating systems, the first position for Linux isn’t a surprise but we have to consider it both on server side and devices side (even if embedded devices based on Linux are a lot). The other OS are only for embedded devices (low constrained devices) so the percentages don’t have any help from cloud side. Finally Linux is useful for IoT gateway too (as we know with Kura) even if Microsoft, for example, is investing in its Windows IoT Core and will release an IoT Gateway SDK in the next months. Not a surprise Amazon AWS with its first position as Cloud services provider but I don’t think about their relatively new AWS IoT platform but all the IoT open source stuff that developers prefer to run on Amazon VMs than Azure VMs. Here the great news is that IoT market is growing and developers/companies are investing in it to try to be on the market as soon as possible. The “bad” news is that too much different protocols and frameworks are used and the way to interoperability and interconnection is quite long or … infinite ? First, my guest article on the M2Mqtt project in the “MQTT Client Library Encyclopedia” blog post series hosted on HiveMQ web site (thanks to the team for asking me to write this entry). It’s great for this library to be part of this “encyclopedia” that will host all main MQTT client implementations in all different languages and technologies in the next weeks. M2Mqtt represents the Microsoft based one developed in C# and available for all .Net platforms (full, compact and micro) and WinRT (Windows 8.1, Windows Phone 8.1 and Windows 10). Second, as always I want to thanks the DotNetPodcast team for registering a new podcast, titled “IoT end to end”, on building an Internet of Things solution from devices to the cloud using all Microsoft Azure related technolgies. 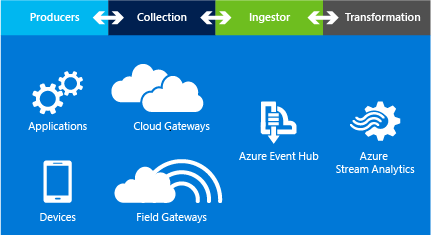 I described all the main steps that builds an IoT scenario speaking about devices, gateway (in the field and in the cloud), protocols, data ingestion with Azure Event Hubs, analysis in real time with Azure Stream Analytics, data storage and presentation to the user. Of course I spoke a little about the future with IoT suite and the new IoT Hub service. I’m sorry for all my non italian friends … but the podcast is in italian. If you like you can find all my podcasts (only two for now) on the dedicated page of my blog. Better Embedded 2014 : sarò speaker sull’Internet of Things ! Quest’anno avrò l’enorme piacere ed onore di essere speaker all’unica conferenza formativa italiana sul mondo embedded, Better Embedded 2014, che si svolgerà il 4 e 5 Luglio a Firenze presso l’Hotel Londra. La mia sessione sarà dedicata all’Internet of Things con uno sguardo alla “guerra” tra i principali protocolli utilizzati quali HTTP (REST), AMQP, MQTT e CoAP (ad essi aggiungerò presto anche XMPP e DDS). Il confronto tra di essi sarà letteralmente sul campo, quindi non più un’introduzione ai protocolli stessi ma singole battaglie su campi diversi in cui ciascun protocollo cercherà di avere la meglio sugli altri. Ci sarà un vincitore ? Per saperlo non vi resta che iscrivervi all’evento e venire a seguire la mia sessione !